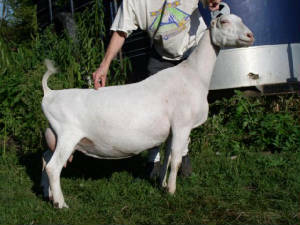 Rose appraised very well as a 5 y.o., scoring within or above the ideal ranges in nearly all categories, doing particularly well in the areas of: 35 Strength; 35 Dairyness; 45 Rump Angle; 34 Fore Udder Attachment; 35 Rear Udder Height; 30 Udder Depth; Very Good in Front & Rear Legs, Feet & Udder Texture & Excellent in Rump. The appraiser commented that in & of itself, Rose's mammary is Excellent but that she'd like to see it more proportionate in size to the rest of the doe, hence the overall "V". Her 2000 daughter GCH Forrest Pride Rosie Miracle 5*M finished her permanent championship as a 2 year old. Rose's 2002 daughter, IR Ranch Orion Baby Ruth LA 2-04 EEVV 89 also did well at the 2003 Nationals, placing 6th in a very large class of lovely & competitive milking yearlings. Rose's 2003 daughter, our own little Lost Nation Dashing Rose Petal is a miniature version of Rose, herself - & has continued the trend, being nearly undefeated in her class for the 2003 season, going Reserve Junior Grand Champion twice & Junior Grand Champion once, winning her dry leg. Dry for 2004, Rose Petal stayed home most of the summer. Spring 2005, Rose Petal presented us with the marvelous mammary we were hoping for, that are becoming a Dash trademark . . . with Rose Petal appraising the highest of our Dash daughters & scoring an impressive 45 in Rear Udder height! Rose's 2003 Dash son, Lost Nation Dashing Rose Rogue was shown 4 times, going 3x1st, 1x2nd, 1x RGCH (standing behind a paternal brother) & 1x GCH. Rose’s 2004 Jrufio son, Lost Nation Jrufio Rose Royce sired some very nice kids here & locally . . .& then went to act as herdsire in another herd. 2007: Buck/Doe twins x Dash . . .that look just like fabulous 2003 twins, Rose Petal & Rogue. We're excited about these kids! Click here to view her full brother "Forrest-Pride Vanilla Sinbad"
Click here to view her half sister "Forrest-Pride Sky Dancer".